Muscle memory is not an unusual phenomenon though, it is very much part of our everyday life. It is responsible for so many of our actions; tying a shoelace, writing words, and in fact the very act of holding a pen. When walking you no longer think of putting one foot in front of another, and if you tried you would actually find it harder and much slower! These actions are all performed subconsciously as they were learnt a long time ago, and when you were probably not aware you were building muscle memory. Humans, and all animals, are remarkable creatures in that they can learn more and more movements, even when fully developed, and this is due to our cells possessing a property called ‘plasticity’. Further examples of muscle memory that are learnt after development include riding a bike, the golf swing, touch typing, and playing a musical instrument: the list is endless. Although diverse, these examples all are acquired by repetition until the movements are performed correctly without conscious thought, typifying the old adage practice makes perfect. Of course the term muscle memory is misleading, because muscles are made up purely of fibres that contract and relax, but have no potential for memory. The actual memory functions are in the brain. This article explains the processes and changes in the brain and nervous system that occur when learning the speed skating stride. How do we move, what is learning, and why is it needed? A definition of learning in terms of a movement, or ‘motor skill’, is an increased speed in execution of that movement without a corresponding deterioration in accuracy. 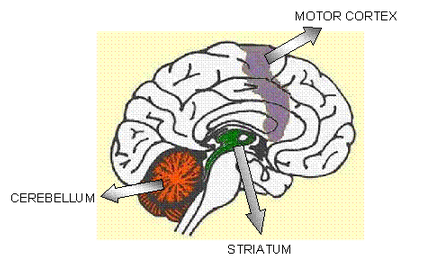 The parts of the brain involved in motor learning are highlighted below and include the striatum (green), cerebellum (orange), and motor cortical regions (purple) of the frontal lobe. Any voluntary movement requires the brain to send messages to the relevant muscles, and these messages are ‘sent’ along nerve cells (hence the nervous system). When you learn movements the messages travel from one nerve cell to another, over and over. Eventually the brain starts to create connections (or pathways) between the nerve cells, so things become easier and you can do them better and better. Since the skating stride will be performed many thousands of times in one race, the most energetically efficient stride will be the most powerful and effective. It is therefore vital that this stride is learnt to a stage where it can be performed without thought, yet with the highest precision (i.e. using muscle memory), as this then allows the skater to concentrate on race tactics. The speed skating stride is broken down into stages, which are learnt individually and then put together – this process is called ‘motor sequence learning’ and is an integral part of developing muscle memory. The learning of a motor skill progresses through a series of unique memory phases and these are mediated by experience-driven changes, i.e. in order for a movement to become automatic and stored in muscle memory, it must be performed many times. Acquisition is the first phase of motor learning and it is where the stages of the stride are performed (separately) for the first time. In order to perform each stage correctly and precisely, the skater has to devote much conscious thought in executing each movement. For this reason, the stride is broken down into stages, as there is otherwise too much to think about at once, and the stride will not be performed correctly. The main areas of the brain involved in this stage are the primary motor cortex, and the cerebellum (shown in the figure below). The role of the motor cortex is to control voluntary movements. The role of the cerebellum is to adjust these voluntary movements based on sensory input (such as visual input, verbal feedback from others, and proprioception (the awareness of where your body is in space)) in order to produce accurate motor output. Therefore the cerebellum is very active in this first learning phase when the initial motor routine is being established. During this initial session, considerable improvement can be seen, which is explained at a cellular level as trial and error of existing nerve cell pathways to initiate the movement, The most appropriate and efficient pathway can be chosen due to all the sensory feedback and this process is called ‘tuning and adaptation’, which is a fast, yet still reversible stage of learning. It is reversible because no changes have occurred to the cells of the brain; there is merely selection of the most efficient pre-existing nerve pathway. By the end of the acquisition phase, no further improvement in performance is seen, because the most efficient pathway is being continually chosen. This phase is dependant on high quality input, meaning that the muscles must be instructed to perform the exact same movement, in order to ensure that the best pathway is being activated. If the movement is varying, the brain cannot carry out its ‘trial and error’ role in order to find the most efficient pathway. The consolidation phase is initiated by the first training session, and occurs 5-6 hours afterwards. It results in the ‘delayed-gain’ phenomenon, which is a large improvement in performance of the movement at the next training session, despite no additional training being carried out. The end point of acquisition is the repeated activation of the same specific nerve pathway in order to best perform the movement. Repeated activation of a pathway is called ‘saturation’, and consolidation induces the nerve cells in this saturated pathway to become more responsive and efficient. The individual nerve cells in a pathway ‘pass on’ the instruction from the brain to the muscle by ‘activating’ the next cell in the pathway. This is by the release of substances celled neurotransmitters from the ends (synapses) of the nerve cell. The neurotransmitters bind to receptors on the next nerve cell in the pathway, and in this way it is activated. 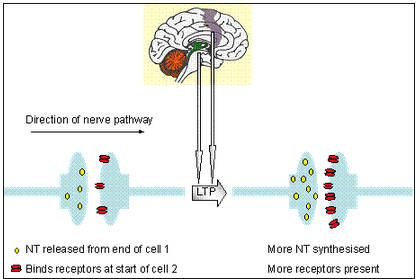 Following the hyper-activation of a nerve pathway, all the nerve cells grow extra synapses and receptors, and synthesise more neurotransmitter (shown in figure below). Therefore when the pathway is next activated, the nerve cells can activate more rapidly and decisively. This process is called long term potentiation (LTP) and it takes several hours to occur, hence the delayed gain. Similarly the nerve-muscle connections gradually become more effective by the same mechanisms, making transmission of the signals more efficient. This cellular plasticity is seen in the nerve cells of the motor cortex, and also those in the striatum. The role of the striatum is to link the idea of a movement, and the expression of that idea (in the motor cortex). Cellular plasticity is not seen in the cerebellum, as the nerve cells here were involved in the feedback, and not the performance of the actual movement. Since the feedback would be different every time the stride was performed, different cerebellar nerve cells would be activated during each repetition, and the saturation needed to initiate changes in nerve cell structure would not be induced. It is debated as to whether sleep is necessary for consolidation to occur, or whether it is just reliant on a minimum defined period of time. Some studies have shown that sleep, and specifically REM sleep, is important for efficient memory consolidation; and that intensity of REM sleep increases post training. This second phase represents the change from short to long term memory. Short term memory events are not repeated over and over, and so no physiological changes in cell structure are induced. Creating long term memory events requires a substantial energy input by the cells of the nervous system, and so the plastic changes in cell structure that need to occur are only induced if the nerve pathway for that specific movement is activated a great number of times. Simply put, if a motor skill is used often enough, it is worth expending the energy required to translate it into a long term memory, as this will save energy in the long term. The third and final stage of creating muscle memory is the retention phase. This stage involves further plastic changes to the structure of the nerve cells, which ultimately leads to the ability to perform the skating stride without thought. As the stride is performed more and more times, the extent of LTP in the both the motor cortex and striatum increases. Muscle synergies are groups of muscles used at the same time in a movement. In order to increase efficiency of the nerve pathways, the muscle synergies used in each of the separate stages of the stride are reorganized together in the cortex, and so are activated together, despite their respective muscles possibly being anatomically far apart. Learning the stride in separate stages allows the correct muscle synergies on the cortex to be formed. From this point, the stages can then be put together by instructing the brain to activate each synergy x milliseconds after the previous one. Since the selection of the pathway is now automatic, or ‘implicit’, then there is no need for cerebellar feedback, as no adjustments have to be made. Therefore the nerve cells in the cerebellum must be ‘deactivated’ to an extent, so that their action does not interfere with, and slow down, the cells in the striatum and motor cortex. Deactivation occurs in a process similar (but opposite!) to LTP, and is known as long term depression (LTD). 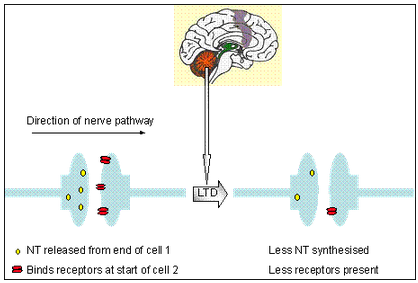 In LTD less neurotransmitter is synthesized and fewer receptors are made available on the cell surface. This makes it less likely for an activated nerve cell to activate the next cell in the pathway to pass on the instruction, and so cerebellar feedback does not interfere. Studies have shown that motor functions, once learned to this stage, can be effectively retained for over a year with no training. With extensive practice, the movement becomes resistant to interference from opposing movements, and passage of long time periods without practice. It should still be noted however, that very little effort by the conscious mind is necessary to override muscle memory. As you can see much patience must be exercised when developing the skating stride, because of the specificity of the learning process. Information gained through experience (practice) is stored in the motor cortex by means of the cellular changes explained above. Since these experience-dependant changes are ‘activity dependant’, they are highly specific because the same pathway has to be repeatedly activated in order for it to become more efficient. If the wrong movement is learnt, correcting it will first require ‘unlearning’ the wrong technique, and then learning the correct one. Therefore, performance of the skating stride must always be identical, and the saying practice makes perfect only holds true if the practice is perfect. Erika Kennington is a cardiac physiologist and active researcher, and skates with LondonSkaters Speed Team. This article also appears in the new eBook ‘The Science of Speed’ by Barry Publow.